One of the biggest problems most brands face is clarifying their message. In the Writing Good Copy series, we provide bite-sized copy tidbits and advice that will drastically improve your audience’s connection with your brand. In this post, we’re talking value propositions. It seems obvious but still needs to be stated – nobody cares about your company’s history, core values, mission statement, products, or services. People might take the time to learn about those things after they’ve discovered your brand can help them. But when first introduced to your brand, all people care about is what you can do for them. How does your brand fit in with their story? Save the other stuff for elsewhere, like your website’s “About” page. What pain points do your users face? What circumstances cause those pain points? How do you help your users overcome those pain points? Answer those questions, then combine and scale back your answers to use as few words as possible. Who are our users? – Brands who want to connect with their audience. What paint points do our users face? – Brands have a hard time connecting with their target audience. What circumstances cause those pain points? – Times have changed. People aren’t interacting with brands the way they used to, especially due to the rise of digital mediums. How do we help our users overcome those pain points? – We bridge the gaps between brand strategy, design, and outreach, specializing in digital. 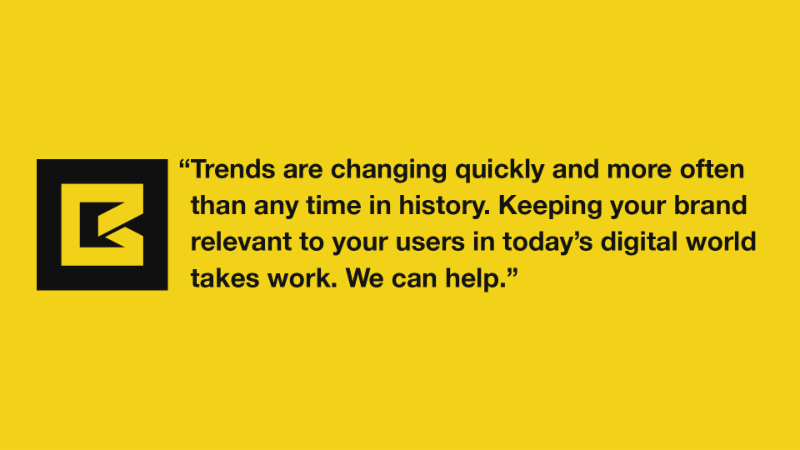 Trends are changing quickly and more often than any time in history. Keeping your brand relevant to users in today’s digital world takes work. We can help. While your tagline is a short, clever statement that draws your audience in, your value proposition completes the work your tagline’s begun. It appeals to your users’ self-interest and piques their curiosity, allowing you time to make your Elevator Pitch – which we’ll discuss next week. Think about a value proposition for your brand. Then, position it within an image and post the image to Instagram with the hashtag #valueprop. And remember, if you’d like to read through the entire Writing Good Copy series at once, you can do so by downloading the Writing Good Copy workbook! Click here to get your free PDF copy.